We decided to enter the Big Blue Ocean Blue race as a 3 person male team as none of our usual female teammates were available for this local event. Having entered the 2 previous years I had a really good idea what to expect and suggested to the team that we try a 3 person boat. I called up Sea Trek in Sausilito as they had helped us out many times in the past. They had one 3 person boat left. Apparently loads of teams had been reserving them for this event. All the arrangements were made, including a late drop off after the race which was really helpful. Now all we had to do was get the boat onto Grants truck and down to Half Moon Bay for the 8 AM race start. Having made all the arrangements for the event a few weeks in advance I though everything was set and we could relax. Yea Right! Sunday before race day Grant and I received an e-mail from our teammate Craig saying that he’d cut his foot badly on a rock while on vacation in Croatia and would need stitches. He wouldn’t be able to race with us. This now meant we had a 3 person boat with only 2 people to sit in it. Grant and I didn’t panic. We discussed the situation over a few beers and pizza on the Sunday night and decided it was time to call EVERYONE we knew to see if they wanted to fill the extra seat. We even asked team BAARBD.org if they wanted to combine resources to see if we could solve our problem. After a few calls and e-mails we were introduced to Mari Chandler. Mari had raced with the Silly Rabbits in the past and was coming back after a foot injury. We were told that Mari was fast but we had no idea how fast she would turn out to be. Mari races with the Nike Farm team and can run a 4:30 mile. I had no idea what that really meant till the race started. I spent the night before the race getting all my stuff together and making sure I had everything ready for the 5AM drive to Half Moon Bay. Grant arrived outside my door at exactly 5AM. Grant had told me that the boat he picked up was big, he even told me it was so big that he had to take the bike racks off the roof and the bikes would have to go inside, but that still didn’t prepare me for exactly how big this boat really was. The poor truck looked like it had the Titanic sitting on it. The front of the truck was in my driveway and the boat still blocked half the street. This was going to be fun. I get in the truck and Grant tells me that he needs to go shopping for race supplies. Its 5AM and he doesn’t have half the stuff he needs for the race, coffee, Ensure, a hat and gas. After hitting him a few times I asked him why he didn’t get this stuff together the night before or at least call me to tell me we needed to leave earlier so as we could go shopping..
We pulled into the gas station on Van Ness and Pine in San Francisco and started to fill the truck. Grant tried to see if the attendant had any coffee going, but she was either sleeping on the counter or had been shot and robbed. Grant was too scared to find out which so we left with just the gas. He’d have to find coffee later as we were supposed to meet Mari at the kayak TA at 6AM and we were already going to be late. We met Mari and set up the boat in a great spot on the beach. I asked Grant if he had his paddle float and pump but he gave me the same dumb look he did at Kernville. Why the hell would I need a paddle float and pump, we’re only going out into Mavericks. You know Mavericks, that World famous big wave surf location. I was speechless and pulled out my float and pump. Could have used two sets of safety equipment for a for a 3 person boat. This time he remembered that he had the spray skirts in the boat so I didn’t have to go shopping around for those before the start. We went to the race HQ to sign in and set up all of our gear in the TA. There were lots of familiar faces and everyone was discussing their post PQ recovery as this was the first race for most people including Grant. We had the pre race briefing and were handed the maps and race instructions. Looking at the maps it appeared that we would be getting additional instructions out on the course as there were a number of mandatory road crossing points but no actual CP’s on the map. I guessed there would be some plotting on the fly so I packed a Basic Roamer AR just in case. It would turn out to be really handy at CP 7 and 10. Todd started the race exactly at 8AM and we had a 1 mile out and back run before we got to the kayak TA. We were first in the water and started paddling the huge boat around the harbor to the breakwater portage. As we rounded the last set of boats we saw Jen and JO of team BAARBD.org coming out from under the docks, they’d found a short cut and were moving fast. This was my first time sitting at the back of the boat steering. I had the deck compass all set up and it was working great. The only problem was I’d never steered a boat this large before and we did a few zigzags across the harbor as I got the hang of it on the fly. We hit the beach in second spot ready for the portage but the weight of the huge boat meant we were a little slow getting to the Ocean side. As we went into the water we were now in 3rd place behind Ultimate Direction and BAARBD.org. As we got out beyond the surf line we started to see the famous Mavericks swell in front of us. It was at this point that the first wave hit us and swamped Grant who was in the front of the boat. Mari and I decided to put on the spay skirts that we’d stashed with us. Grant tried to put his on and remembered that he still had on his backpack. The spay skirt wouldn’t go over it. It was going to be a wet ride in the front of the boat. I never worked out why he didn’t take his pack off at that point. We were paddling hard and maintaining our position out to the first buoy until the team from City kayak came past us in their 3 person boat like we were standing still. They would go on to be the first team out of the water after an amazing paddle. They looked smooth and strong in the boat and we would be trading places with them all day. There was a little navigation confusion out on the water but nothing too serious, I called over to Team BAARBD.org and discussed it with JO and we both headed off in the right direction. Grant had to stop paddling a couple of times to empty the bath that he was sitting in. Not having a spray skirt on had filled up his end of the boat and we were sitting a little low in the water at the front. 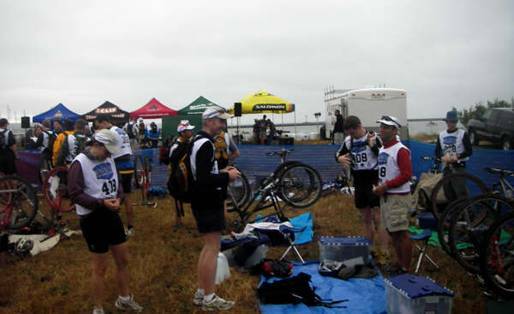 The rest of the paddle was fine and we hit the beach in 4th place and ran to the TA for the first bike leg. 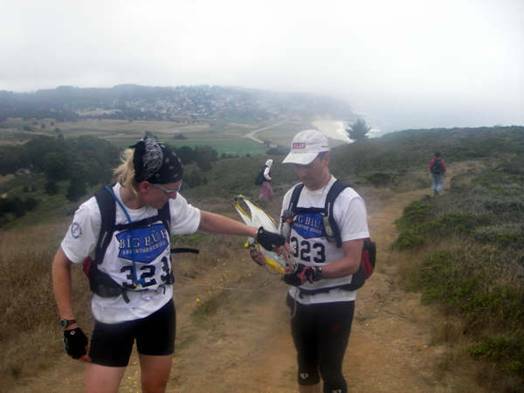 We were out of the TA in 3rd place after a fast transition and flying down the coast to CP 6. At CP 6 we were given additional instructions for a treasure hunt in downtown Half Moon Bay. This now made the mandatory way point to cross the highway make sense. We needed to take a particular underpass to get across Highway 1. We started running and were gaining on the team in front of us but they didn’t take the underpass, they just went straight across the highway. We had been told that it was mandatory to use the underpass that that there would be penalties. By the time we had taken the long way around to downtown via the underpass, there were now a bunch of teams already there who had obviously just crossed the highway. We started asking locals for directions to the specific locations that we had been given questions for. There had been no map handed out for downtown so the only way to find anything was to ask. We answered all the questions with a little help from our friends at BAARBD.org and hit the underpass back to CP6 and our bikes. Mari had me on the tow line and I now see how she does 4:30 mile times. She was super strong and I had the bungee tow line on full stretch as my short legs worked overtime to keep up. I could tell that Grant thought this whole thing was funny as he trotted along a little out of the way just in case the bungee snapped. It was going to leave a big welt if it let go. I get the feeling that Mari wouldn’t have noticed if I had fallen down, I’d have just been dragged along like that dog in the National Lampoons Vacation Movie where all that was left behind the car was the collar and leash. We’d lost a lot of time to the front teams and now needed a good bike let to catch up. Getting to CP 7 required another crossing of Highway 1. This time it was via the famous 4’ high stream culvert. Grant had never been through this so we warned him about the step that was half way through so he didn’t end up on his face. At CP 7 we were given another set of instructions. This time we had to plot a number of CPs using a true north bearing and a distance from CP 7. This is where the Basic Roamer came into its own as it’s exactly what the tool was designed for. (See image at end of report) We heard JO tell Jen that something must be wrong because the instructions that she had given them had now taken him off the map. Grant realized what had happened and helped them out. 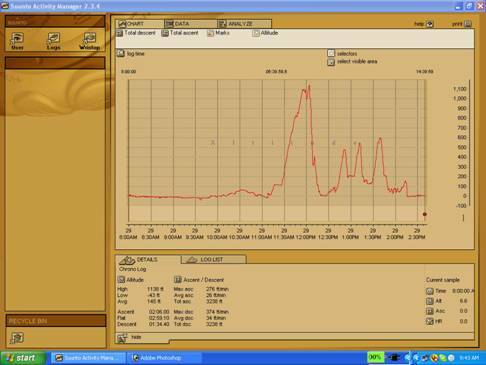 Every point had to be plotted from CP 7 not the previous point. We’d finished plotting and were off to CP 7a. There were 2 ways to get up to the ridge, one was steep and fairly straight, the other was a lot longer and not as steep. As we were climbing up the steep route we could look across the canyon and see the team that had left before us losing ground on the longer trail. We were happy that we’d made the right choice as I had thought about taking that trail but decided against it. After some very hard riding and a little bike pushing, we hit all the CP’s and we flew back down the canyon using the steepest and fastest trail down. We saw a bunch of teams coming up this trail and it brought back memories of the first year I did the race where I saw people coming up puke from the effort. It’s a long steep trail and best taken downhill. The next leg took us back to the start and main TA to check in before we headed North on the bikes to the next set of CP’s. As we entered the park we had another choice to make. We could take the short steep route or the longer twisty trail. Again I chose the short steep route and it paid off. We arrived at CP 9 easily and as we were going to CP 10 we saw the other teams coming towards us on the trail. We’d made up a bunch of time. As we hit CP 10 we had to drop the bikes and plot the next orienteering section. We were doing fine and the plotting was quite straight forward especially with the Basic Roamer AR but we would soon find out that there was a definite communication problem between Grant and Myself. For the third set of instructions I’m sure I heard 2 degrees and plotted the point where I thought it should be. When we arrived at the location there was no CP. I checked the map and the plotting again and realized that it should have been 32 degrees. This put the point back on the other side of the hill from where we were. We now had about a 400 foot climb back up the hill to get the CP. Mari threw out the tow line and dragged me back up the hill. We’d lost a little time but somewhere in here we passed team City Kayak for the lead spot in the 3 Person Co-Ed division and we’re chasing BAARBD for the 3 place on the podium. We hit CP 11 spot on without any delay and caught BAARBD at the mystery lighthouse CP. It was going to be a sprint for the finish. We were together at CP 12 but fell a little behind on the way to CP 13 when I failed to warn Mari, who I was towing on the bike, that we were taking a short single track to the left off the main trail. As I took the left I heard a yell from behind and my bike slowed as I was now dragging Mari and her bike along the ground. Somewhere in this incident my rear derailer was mangled, making gear selection hit and miss. This slowed us a little and BAARBD were getting away. We caught them again at CP 13 on the beach but they managed to leave a few seconds ahead of us. In the mad charge back to the finish I didn’t read the final instructions carefully enough. We knew we had to go to CP 5 before the finish but forgot that we had to do it on foot. We arrived at CP 5 and were told we had to go back and drop our bikes in the TA. Mari was on fire at this point and threw out the tow line once again. We were on full sprint to make up for our mistake because City Kayak were just behind us. We came across the finish line just behind BAARBD for 4th place and first in the 3 person co-ed division. It had been a really fun event and a close battle with some very fast teams. Todd had a BBQ going and the Mavericks Brewing Company supplied beer for the teams while we waited for the final results and prize presentation. 1. 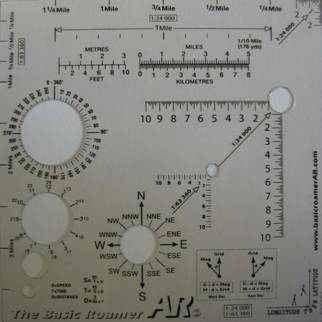 Degree circle overlay for plotting the bearings on the map. 3. The magnetic declination calculations help us get from magnetic north to the true north values.